SELF-ABSORPTION isn’t thought of favorably and generally means to be excessively concerned with one’s own life and interests without taking into consideration other people. Some synonyms are egoism, self-centeredness, narcissism, self-importance, self-preoccupation, etc. However, in my thinking this morning while chanting, which is the attempt to “hear” God in his holy names, or become absorbed in the Supreme Self, we need to be self-absorbed in the sense of becoming aware of those parts of ourselves that need to be adjusted and purified. When we are chanting or praying we become aware of our highest ideals and our various types of material interests, or even our lowest worldly desires. 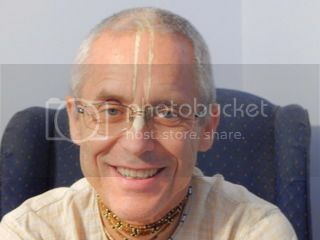 Prabhupada has compared chanting the holy name to making ghee. In ghee making, we boil butter, and must work to skim off the “impurities” or milk solids which rise to the surface. Then we will be able to create clarified butter, or ghee, which has so many medicinal properties and uses. This is an interesting analogy which can help us in our daily spiritual practice. We can think of our spiritual practices, like chanting the holy name, as the cleansing fire, that is meant to burn up the impurities or material contaminations. If we expect to go anywhere spiritually we have to keep turning on the fire of purification through the nine processes of bhakti, especially hearing and chanting, so we can remember who we actually are as sparks of Divinity imbued with the serving nature, beyond material changeable designations. To go beyond superficial appearances we must dig deep to what we may not want to look at, to uncover our conditioned, or “naked” self, free from colored pretenses, either thinking we are great or are nothing. In spiritual life we must understand where we are, and where we aspire to go. When we are in touch with Radha and Krishna through their holy names we are seeking the grace of purification to remove the dust covering our true soul hearts. This “dust” of bodily identification by putting ourselves above all others and all things of the world, prevents us from understanding or “seeing” our real self, or effulgent soul. Thus this morning I am self-absorbed in praying to rise above my conditioned nature and those many desires I have cultivated over lifetimes of material enjoyment. I am “beginning with the end in mind,” regarding passing through the different stages of bhakti, to come to pure prema, or love of Krishna and everything in relationship to him. I am self-absorbed with the prayer to give the highest service to the greatest number of people possible, to be a surrendered and willing instrument, and no longer a mixed, mediocre devotee. I'm self-absorbed to want to be able to accept whatever is required for spiritual progress and for sharing whatever I have been blessed with. I still see and feel what binds me to the world, and that part of me that still desires what is unfavorable for progress in bhakti, yet I also feel blessed to have an intensity to also want and pray for spiritual advancement to rise above worldly passions and live the life of the soul in love with Krishna. And I am self-absorbed to share all this with you with the hope and prayer to benefit you. We are students and teachers of one another, and can help one another rise up, and keep the fire of spiritual life burning brightly. May we always be willing to lend a helping hand when needed. Let us be like bees who find the nectar, not like flies to find sores and spread infections. Love. Encourage. Reassure. Inspire. Cheer. Boost.